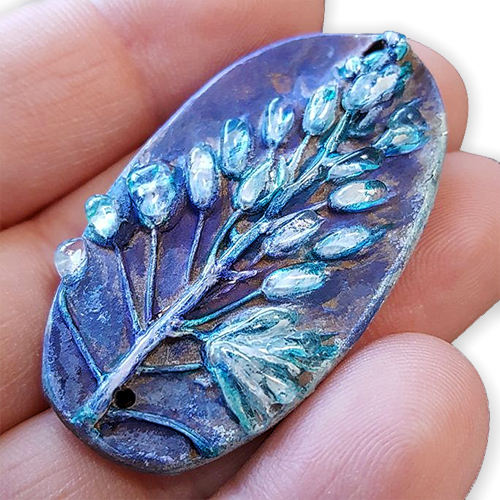 Though she often uses polymer as a form for her electroformed copper work, Annie Laura (AnnieLauraHandmade) sometimes features the clay itself, as in this relief of a flower from her garden. She created a deep mold of the flower. Its depth gives the bead startling dimension. The painted colors are scrumptious and she finished by highlighting each bud with a dab of clear coating. 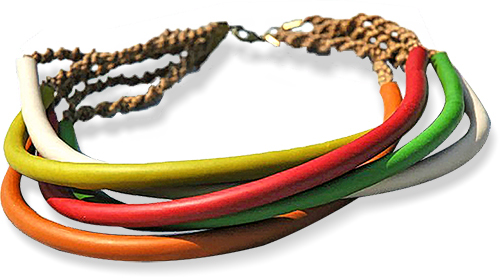 Have a look at Annie Laura’s lovely electroformed pieces. When she needs a break from metal and glass work, she creates another batch of her polymer ammonites and sea urchins that integrate well with other media. What a pleasure to work with a material that offers such versatility. Annie Laura’s full name and location weren’t easy to find. Can you help fill in the blanks? Have a great weekend and join us at Studio Mojo for a look at other wild and wonderful ways to use polymer. It’s summer and you know what that means. Sharks and other sea creatures will be in the news. 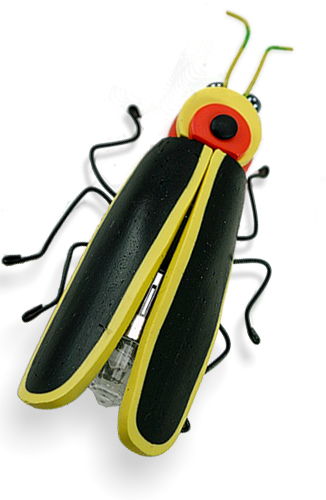 Like this strange polymer species from Estelle Marchal’s Les Ptitsmobiles. Estelle moved to Grenoble, France where she’s unpacked and back in the creature business. A scroll through her Facebook collection of stylized octopuses, carnivorous plants, stingrays and other oddities is sure to make you smile. They will soon populate her shop and her Instagram page. She often turns her creations into mobiles that protect children while they sleep. Estelle is a molecular biologist when she’s not making sharks. The polymer community attracts lots of scientist/artists who enjoy reinterpreting the lifeforms they work with. Belgium’s Tine Demol shows us how sophisticated long extruded tubes of polymer can become. She suspends the cluster on macrame spirals. 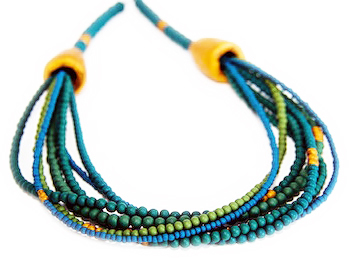 In the second piece Tine gathers seven strands of small round polymer beads in various hues of greens and blues into a rich twist accented with dashes of yellow. 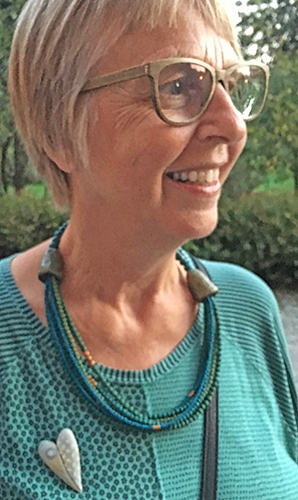 Here she is wearing a similar necklace at FIMO50. When your colors make a statement, simple techniques are all that’s required. Do your colors speak for themselves? Here’s Tine on Facebook and Flickr. Are there fireflies in your yard this summer? 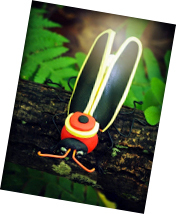 Melissa Terlizzi offers a great class in making your own lightning bugs for beginners to experts with her CraftArtEdu online class. Here’s the rundown of CraftArtEdu’s newest classes. Melissa turns a simple cane, wire for legs and an LED light into a delightful summer project that becomes a cute zipper pull or decoration. 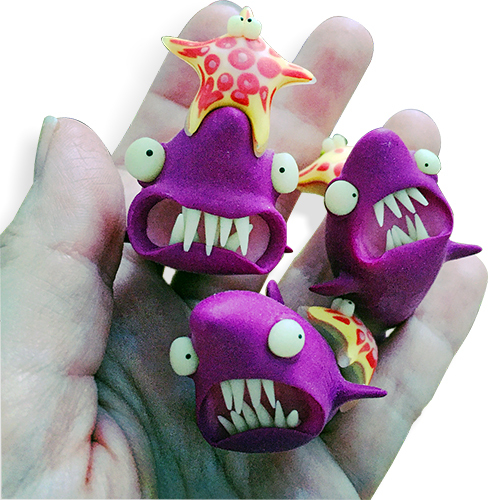 She loves to reinterpret nature’s creatures in polymer as you will see on Facebook and Flickr. Here’s a good project to engage the nature lovers in your life. 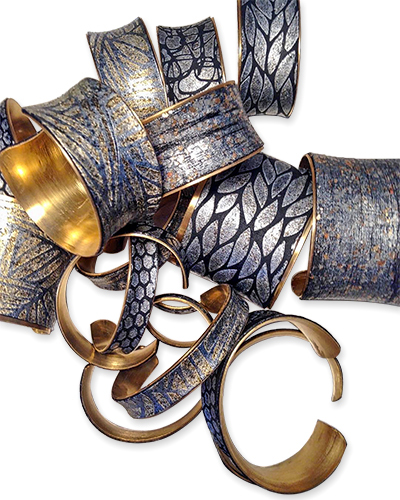 Don’t you love the slightly concave curve of these cuffs from Boston’s Betsy Baker? Her silvery polymer veneers are enhanced by the brass forms. This pile of prototypes is part of a new wholesale line Betsy is building. She offers this early peek on Instagram. Go to her site to see how she elegantly transforms vintage components and gives them a fresh flair by combining them with polymer. For your weekend enjoyment, take some time wander online to see the splendor that’s been submitted to the international Into the Forest exhibit. Now try to imagine how the curators will assemble it all for the November month-long exhibit in Pittsburgh! These glorious flowers from San Diego SandyCamper Marni Vigil look like the day lilies blooming in my yard. There are hints of Marni online on Facebook but she keeps a low profile…like many of the other quiet contributors to the exhibit. Look at all the pods, blooms, berries, bones and more on the exhibit’s Facebook page and Instagram. 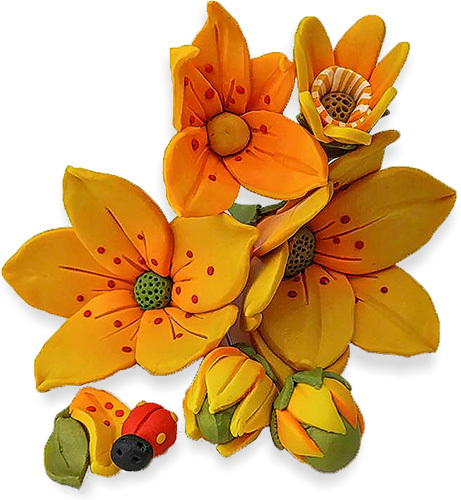 It’s a stunning array of polymer from hundreds of artists in 32 states and 22 countries. Put the event on your calendar, contribute to help cover their costs, and be proud of what you and the community are accomplishing! And join us over at StudioMojo for juicy weekend updates.